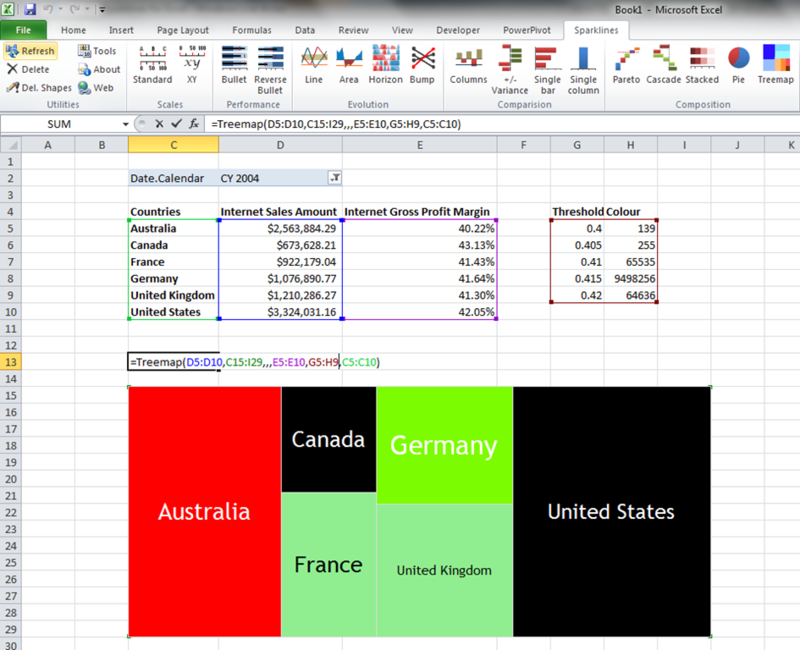 While the introduction of native support for sparklines and other microcharts in Excel 2010 was welcome, Excel is still lacking more advanced visualisation features. I came across Sparklines for Excel – a free Excel addin that gives you a lot of extra charting options, not just sparklines – a while ago but I’ve only just got round to playing with it and I have to say it’s a lot of fun. I’m not much of a data visualisation expert (I’ll leave that to the likes of Jen) but it’s a subject that every BI professional needs a passing knowledge of and in any case it’s a shiny new toy to play with, so it’s worth a blog post. Cool, eh? And of course, as soon as you change the dropdown filter to select another year, or change any of the threshold values, the treemap updates too. Even the position, length and width of the treemap itself can be parameterised. You can see the full list of chart types – including heat maps, cascade charts and Pareto charts – in the manual here. It’s definitely worth checking out if you’re an SSAS or PowerPivot user who’s into data visualisation and on a tight budget. Over the last few years I’ve been doing more and more training – my MDX, SSAS cube design and performance tuning courses continue to be extremely popular – and I’ve also seen how successful preconference seminars at conferences like SQLBits have become. It’s my opinion that there’s significant demand for SQL Server training that is either at a more advanced level than the big training companies can offer, or that covers niche topics that the big training companies would never bother with such as MDX. Equally, I believe that more experienced developers would rather be taught by people like them, who have used a technology in the field, written books and blog posts, and have real-world knowledge, rather than professional trainers who (by definition) spend most of their time training. I’m really excited to be working with the likes of Christian, Jeremy and Andy for this first group of courses – they really are the acknowledged experts in their particular areas. All the courses will be run in central London, so they will not only be convenient for anyone in the UK but also easily accessible for attendees from Europe or further away. Finally, I’d like your help in making my new company a success. But don’t worry, I’m going to pay you for it! If you run a user group, a small consultancy, a training company or are a contractor or a blogger, you may be interested in my affiliate programme. You can find more details on the site, but basically I will pay 20% of the price of the course for each registration that an affiliate sends my way. For example, for Andy Leonard’s SSIS course that means I’ll pay £399 per registration in commission – which hopefully is enough motivation for you to mention these courses to your friends, colleagues, customers, blog readers, Twitter followers and so on. 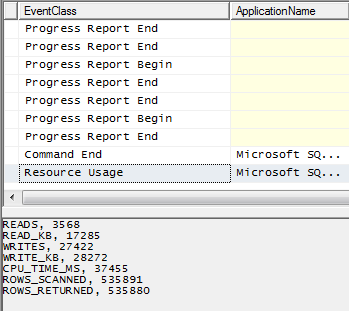 As I mentioned a few months back, some new functionality snuck into SSAS with SQL 2008 R2 SP1, the most interesting of which is a new Profiler event called Resource Usage (Thomas Ivarsson recently blogged about some other new events too). I’ve been doing some investigations on it recently, and asking the SSAS dev team what the information it returns actually means (Akshai Mirchandani is the source for much of the content of this post and I’m very grateful for his help), so I thought I’d blog my findings. Essentially, it gives you information that is very similar to what’s already available in Perfmon but specific to a particular query or command. The problem with Perfmon is that it’s easy to spot strange things happening in the data it gives you, but there’s no sure-fire way of linking what you see in Perfmon back to individual events such as queries executing; the Resource Usage event solves this problem. The data returned relates purely to Storage Engine operations as far as I can see and does not relate to the Formula Engine – I get no values back for queries that hit the Storage Engine cache but are nonetheless slow because they are Formula Engine bound. It’s clear from these numbers that a lot more work is going on in the Storage Engine compared to the previous two queries, although I’m not sure it’s worth trying to read too much into what the exact values themselves actually represent (unless of course you happen to be Jeffrey). I think it’s also going to be dangerous to make simplistic general recommendations about these values: while in some cases trying to keep the values returned as low as possible will be a good idea, I’m pretty sure there are going to be other situations where a more efficient query would involve more reads from disk, or scanning or returning more rows, than a less efficient version of the same query would. 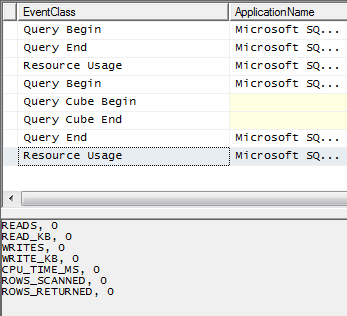 That said, this is useful and interesting information and another weapon in the arsenal of the SSAS consultant out in the field trying to diagnose why a query is slow and what can be done to tune it. This is probably the 5th or 6th post I’ve written on this problem (most deal with MDX, but I did blog about solving it in DAX early last year) but what can I say – it’s an interesting problem! 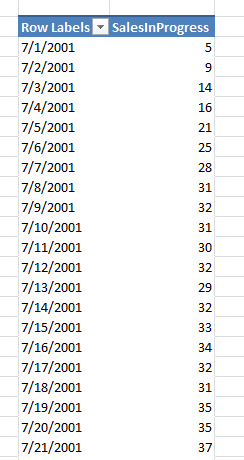 I came across it at work today while working with the 2012 CTP3 version of PowerPivot and found yet another solution to the problem that used some of the new DAX functionality, so I thought I’d crank out one more blog post. Quite an elegant solution, I think. Numerous people have already blogged about this in detail (Denny Cherry has a very good overview here); the big news from my point of view is the new BI Edition. Some people have been asking for a separate BI Edition for some time (although I was in two minds on the subject) and it will certainly have a lot of advantages: ok, it doesn’t support per-core licensing, only the server+CAL model, but in every other respect it’s the same as Enterprise Edition feature-wise so it will be a cheaper option for many BI projects. 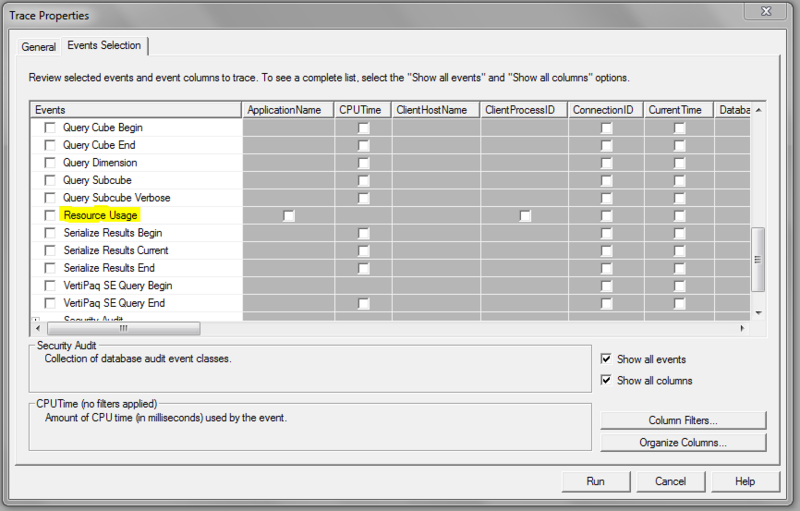 I’m a bit surprised to see Tabular didn’t make it into Standard Edition, though, which is unchanged in terms of features from SE in 2008R2 – I would have thought if Tabular was meant to bring SSAS to a wider audience then it should be positioned as the starting point for those who are new to BI; as it is only Multidimensional will be available in Standard Edition.